We’d love your help. Let us know what’s wrong with this preview of Steampunk II by Ann VanderMeer. Blending the romantic elegance of the Victorian era with modern scientific advances, the popular Steampunk genre spotlighted in this collection is innovative and stimulates the imagination. This artfully assembled anthology of original fiction, nonfiction, and art can serve as an introduction to the Steampunk culture or provide dedicated fans with more fuel. Stories of out Blending the romantic elegance of the Victorian era with modern scientific advances, the popular Steampunk genre spotlighted in this collection is innovative and stimulates the imagination. This artfully assembled anthology of original fiction, nonfiction, and art can serve as an introduction to the Steampunk culture or provide dedicated fans with more fuel. Stories of outlandishly imaginative technologies, clockwork contraptions, eccentric heroines, and mad scientists are complemented by canon-defining nonfiction and an array of original illustrations. This collection showcases the most sensational Steampunk talents of the last decade, including Daniel Abraham, John Coulthart, William Gibson, and Margo Lanagan, and demonstrates exactly why the future of the past is so excitingly new. To ask other readers questions about Steampunk II, please sign up. I ordered this book in a fit of indulgence a couple of years ago, along with a lot of other titles from Thriftbooks. I had never intentionally read steampunk before, but had heard about it and decided this would be a painless introduction. Well, turned out to be not so painless. Of the 26 stories in this volume, only five held my attention to the end. The others would either be too weird for me to start with or else lost my interest after a few pages. I skimmed the first pages of those other 21 I ordered this book in a fit of indulgence a couple of years ago, along with a lot of other titles from Thriftbooks. I had never intentionally read steampunk before, but had heard about it and decided this would be a painless introduction. Well, turned out to be not so painless. Of the 26 stories in this volume, only five held my attention to the end. The others would either be too weird for me to start with or else lost my interest after a few pages. I skimmed the first pages of those other 21 stories, but just couldn't get myself to finish any of them. Of the five I did finish, Wild Copper by Samantha Henderson was my favorite, with The Cast-Iron Kid by Andrew Knighton a close second. I'm glad I tried the book, but I'm also glad to put it away. Maybe someday I'll give it another try. I might need to be in the proper mood, who knows. While the first anthology only contained one story I was less than happy with, there are at least four or five in Steampunk II: Steampunk Steampunk II: Steampunk Reloaded is the second steampunk anthology edited by Ann and Jeff VanderMeer, following 2008’s first installment. It contains about twice as many stories as its predecessor, but unlike the first collection the quality is more uneven here, resulting in a less impressive but still fascinating anthology that should please fans of the genre. Still, even if you go by that rule, “The Gernsback Continuum” by William Gibson, while a brilliant story that everyone should read, hardly feels like steampunk, unless you consider “any story that imposes science fiction tropes on an earlier period of history” a valid definition. Regardless, it’s hard to complain about a story that’s so famous and so excellent. Another example of a great story that seems to be at best peripheral to steampunk is Stephen Baxter’s “The Unblinking Eye,” which feels more like an elaborate alternate history that happens to have airships in it. Similarly, “The Unbecoming of Virgil Smythe” by Ramsey Shehadeh is a quirky and highly entertaining story that mixes Murder on the Orient Express with trans-dimensional aliens, but if it didn’t happen to be set on a steam train, I doubt anyone would even consider it as steampunk. Still, all three of these stories are excellent, whatever subgenre you stick them in. Other highlights of the collection that feel more authentically steampunk are Jeffrey Ford’s “Dr. Lash Remembers,” about a steam-borne plague affecting the sufferers’ perception of reality, and Caitlín R. Kiernan’s “The Steam Dancer (1896),” a beautifully written, melancholy tale about a dancer made whole by steam-driven technology. My single favorite story in this collection is Margo Lanagan’s “Machine Maid,” a steampunk story that feels like a true period piece aside from the steam-powered automata. It features an awkward but unforgettable protagonist and some of the best writing in the collection. Another excellent story is “As Recorded on Brass Cylinders: Adagio for Two Dancers” by James L. Grant and Lisa Mantchev, describing the meeting of two relics of the steam age in a modern mall. It almost feels like a steampunk version of Kage Baker’s COMPANY universe. While it lays on the emotion a bit too heavily at times, it’s a gorgeous, touching story that employs many of the standard themes and devices of the genre but still comes out looking and feeling original. A true gem, appearing towards the end of the collection, is Catherynne M. Valente’s “The Anachronist’s Cookbook.” Its protagonist — who puts the “punk” back in steampunk in a big way — resembles a Victorian version of Richard K. Morgan’s Quellcrist Falconer. Also riffing on the political side of steampunk, but entirely on the opposite end of the scale in terms of seriousness, is G.D. Falksen’s “The Strange Case of Mr. Salad Monday,” a fun story about a steampunk version of the blogosphere and an intrepid detective trying to catch a suspected socialist dissident. Cherie Priest contributes “Tanglefoot,” a story set in the same world as her CLOCKWORK CENTURY books, but despite its charm, the story unfortunately goes on a bit too long for my taste. More successfully, Daniel Abraham delivers “The Adventure of the Emperor’s Vengeance”, a solid and entertaining story about Balfour and Meriwether, two agents of the British Empire attempting to stop a curse from the past. Closing out the fiction portion of the anthology is one of the strangest stories I’ve read in years, “A Secret History of Steampunk” by a collection of writers and artists working under the pseudonym “The Mecha-Ostrich.” It reads somewhat as if Jeff VanderMeer were being remixed by a handful of authors, or possibly vice versa. It cleverly connects to several other stories in the collection, and while it’s not entirely successful, it’s definitely innovative and unique. The final section of the collection offers two non-fiction pieces about the non-literary side of steampunk (about fashion and the DIY/Maker culture, respectively) and a brief “Roundtable” interview about the future of steampunk. This section makes the anthology relevant not just as collection of stories but as a snapshot of an entire subculture, as does the artwork, which is one of the only aspects where Steampunk II: Steampunk Reloaded has the upper hand over its otherwise stronger predecessor. There are a few neat Terry Gilliam-circa-1970-style illustrations mixed into the book, and the Mecha-Ostrich story features some especially gorgeous artwork. Steampunk II: Steampunk Reloaded is another strong collection of stories from a subgenre that seems to be gaining in popularity every single day. If not for a handful of entries that bring the overall quality of the collection down, this would be another unqualified winner. If you’re new to the genre, I’d still recommend picking up the earlier Steampunk anthology first, but this second collection contains enough excellent stories to make it worth your time if you want to dig a little deeper. The more steampunk I read, the more I become convinced that it does not deserve to be considered it's own genre. This collection, which seems to have been put together as an attempt to show that it is it's own thing, and in the process manages to do exactly the opposite. A diverse collection, spanning all sorts of genres, where the only thing linking them together is the Victorian ascetic, and even that sometimes feels totally unnecessary and even tacked onto what would otherwise have been a fine story. Solid steampunk fiction--even better than the first one, in my opinion! My faves are: "Machine Maid" by Margo Lanagan; "The mechanical aviary of Emperor Jalal-ud-din Muhammad Akbar" by Shweta Narayan; "A serpent in the gears" by Margaret Ronald; and "The strange case of Mr. Salad Monday" by G. D. Falksen. But it's all solid! A MUST read for any steampunk fan. Better by far than the first anthology in the set, in spite of doubling up on a story also featured in the Extraordinary Engines anthology edited by Nick Gevers. Some I loved, some I could have done without. A collection worth reading, if steampunk interests you. I quite enjoyed the two nonfiction essays at the end, as well. The usual mix-bag of good, bad and meh stories. I started out enjoying the eclectic feel of the stories, which didn't always (or even usually?) fit into my preconceived notion of what Steampunk is supposed to be. A great many of them tended to veer quite a more into fantasy than expected. Toward the end, however, the slow pace and intentionally archaic language became tedious and I started a lot of skimming. I picked this volume up because it included, "Tanglewood", a "Clockwork Century" story by The usual mix-bag of good, bad and meh stories. I started out enjoying the eclectic feel of the stories, which didn't always (or even usually?) fit into my preconceived notion of what Steampunk is supposed to be. A great many of them tended to veer quite a more into fantasy than expected. Toward the end, however, the slow pace and intentionally archaic language became tedious and I started a lot of skimming. I picked this volume up because it included, "Tanglewood", a "Clockwork Century" story by Cherie Priest. As expected, it was one of the good ones, though also not what I expected. My favorite was "The Strange Case of Mr. Salad Monday" by G.D. Falksen, with it's odd take on 19th Century social media. I don't give stars or ratings, that's just the way my reviews are, but that doesn't mean the book isn't great. The award-winning editorial team Ann & Jeff Vandermeer does it again with their sequel to their original Steampunk anthology. “Steampunk II: Steampunk Reloaded” brings together a triumvirate of Steampunk spectacularness — original fiction, reprinted short stories, and non-fiction. The twenty-seven stories and articles represent a broad cross-section of Steampunk by some of the best in I don't give stars or ratings, that's just the way my reviews are, but that doesn't mean the book isn't great. The twenty-seven stories and articles represent a broad cross-section of Steampunk by some of the best in the genre. “Tanglefoot” by Cherie Priest is a Clockwork Century story. There are also stories by G.D. Falksen (“The Strange Case of Mr. Salad Monday) and Tanith Lee (“The Persecution Machine”). Besides the usual stories and “What is Steampunk” articles there’s a couple of unusual pieces that add depth and spark to an already good anthology. “Ada Lovelace: The Origins” by Sydney Padua is a delightful alternate history comic. “The Secret History of Steampunk” by The Mecha-Ostrich and Catherynne M. Valente’s “The Anachronist’s Cookbook” also make for interesting reading. This is a well put together anthology suited for both lovers of Steampunk and those new to the genre. The cover is beautiful and the anthology as a whole is artful, from the incredible illustrations to the advertisements in the back. Even the designs around the page numbers and title fonts add to the ambiance and aesthetic, pulling the whole anthology together in a way that makes it more than a mere collection of stories. Steampunk Reloaded is a rather good collection of steampunk tales. It has it's ups and downs, but overall the stories are enjoyable. Along with the stories, there are a couple of interesting non-fiction pieces and a round-table interview about the future of steampunk. -- In "The Unblinking Eye" by Stephen Baxter, Europe has advanced steam technology, but has never ventured toward the new world. Rather it is the Incas, who have developed thei Steampunk Reloaded is a rather good collection of steampunk tales. It has it's ups and downs, but overall the stories are enjoyable. Along with the stories, there are a couple of interesting non-fiction pieces and a round-table interview about the future of steampunk. -- In "The Unblinking Eye" by Stephen Baxter, Europe has advanced steam technology, but has never ventured toward the new world. Rather it is the Incas, who have developed their own advanced technology, and have ventured into lands unknown, colonizing each new territory they come across. come to pay Europe a visit. -- Caitlin R. Kiernan tells the story of a maimed young woman, who has been outfitted with steam-powered limbs in "The Steam Dancer." -- "The Mechanical Aviary of Emperor Jalal-ud-din Muhammad Akbar" by Shweta Narayan, presents a new take on a traditional folktale, involving the beautiful clockwork birds of the Emperor's aviary. -- "Wild Copper" by Samantha Henderson can barely be labeled steampunk genre. It's more of a fairy story, in which a girl offers to serve Oberon to save her brother. Steampunk or not, this is still a great tale. -- An lonely orphan builds himself a mechanical friend in "Tanglefoot (A Clockwork Century Story)" by Cherie Priest. But his souless begins to take on a life of its own. -- "The Anachronist's Cookbook" by Catherynne Valente rails against the accepted politics of a steampowered era as it presents the exploits of an angry and vicious young woman. decided to give it a go. especially for something I didn't find particularly interesting. this is a book well worth reading. I admit, I am fairly new to Steampunk, but I was under the impression that it was a genre of adventure, science, romance and mystery. What I got from this book was a mix of those elements, but generally in a very boring package. The ideas behind the stories were imaginative enough, but the execution of most of them was dull and lifeless. Some of the stories had no clear link to Steampunk at all. They were more in line with fantasy, and not particularly interesting fantasy. I was also under the i I admit, I am fairly new to Steampunk, but I was under the impression that it was a genre of adventure, science, romance and mystery. What I got from this book was a mix of those elements, but generally in a very boring package. I was also under the impression that a writer of Steampunk would have an understanding of machinery and the properties of metal and other things related to the Victorian mind set. No, I did not expect a minute technical understanding of metallurgy. But a passing knowledge of what things are made of would have been a good start for a few of the authors who contributed their work to this book. I requested this Steampunk II at the library in order to read one story within it, "The Strange Case of Mr. Salad Monday" by G. D. Falksen, and ended up reading beyond Mr. Falksen. Steampunk is a difficult genre to define (is it even a "genre"?) and this book only confirmed how difficult it really is. Science fiction meets Victoriana, with Egyptology, alternate history, and many other odd bits stirred in here and there. The writing that captured me the most included whimsy or a touch of The Twil I requested this Steampunk II at the library in order to read one story within it, "The Strange Case of Mr. Salad Monday" by G. D. Falksen, and ended up reading beyond Mr. Falksen. Steampunk is a difficult genre to define (is it even a "genre"?) and this book only confirmed how difficult it really is. Science fiction meets Victoriana, with Egyptology, alternate history, and many other odd bits stirred in here and there. The writing that captured me the most included whimsy or a touch of The Twilight Zone. One story blended Pacific NW Native American folklore with the faery kingdom. Oberon and Titania in exile near Puget Sound. Wow. I'm torn between 3 & 4 stars. It's a solid 3.5 stars. What do you expect with a collection of stories though? Some are excellent, some bored me to tears and others were just your typical middle of the road stories. Overall, it's a good book - nice that you aren't tied into an overarching storyline and you can read it in smaller snippets... but somehow missing the overarching storyline (if you know what I mean). I did enjoy the shorts by authors that I've read recently - they tied in with the v I'm torn between 3 & 4 stars. It's a solid 3.5 stars. What do you expect with a collection of stories though? Some are excellent, some bored me to tears and others were just your typical middle of the road stories. I did enjoy the shorts by authors that I've read recently - they tied in with the varied series that I have completed or am in the midst of, adding a new side to some lesser characters. If you read steampunk, I recommend this. If you are deciding that you may want to start, this could be a good place. Just be forewarned that you may hate some while loving others. Just finished it. As with any anthology, there are stories you like or dislike. I found the following especially noteworthy. Andrew Knighton's "Cast Iron Kid" steampunk gunfighter. Old west with steam powered appliances, fun. Margo Lanagan's "Machine Maid" What wickedness you can do with an automaton. Cherie Priest's "Tanglefoot" evil spirits and steam power. spooky and fun. Daniel Abraham's "Balfour & Meriwether in the Adventure of the Emperor's Vengence" was just prain fun along the lines of S Just finished it. As with any anthology, there are stories you like or dislike. I found the following especially noteworthy. Daniel Abraham's "Balfour & Meriwether in the Adventure of the Emperor's Vengence" was just prain fun along the lines of Sherlock Holmes meets the League of Extrodinary Gentlemen. This anthology contains 22 stories plus the unofficial history of Steampunk. While I recognize some of the authors – Gibson – Priest – Baxter – Kiernan, I was not familiar with them all. As you would expect there is a cross genre mix of fantasy and science fiction authors. Each story is preceded by an introduction of the Author and some of their other work. Some stories stick closely to the Steampunk genre while others stretch it into horror and other genres. 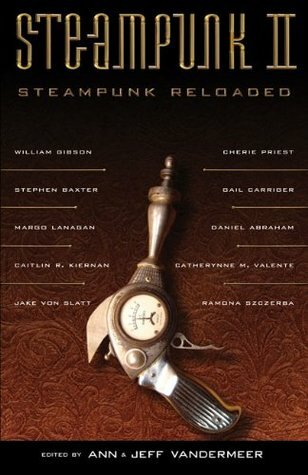 It was a pleasant read, and I am always This anthology contains 22 stories plus the unofficial history of Steampunk. While I recognize some of the authors – Gibson – Priest – Baxter – Kiernan, I was not familiar with them all. It was a pleasant read, and I am always interested in how a group of authors can be brought together with a single goal, and then approach that goal from some many different directs. I have a shelf of books that I've finally completed, but I was inclined to remember to do this book because I was just thinking about it today. I enjoyed the short stories, but moreso, the author's take on steampunk and its 'movement' and longevity. If you like anything Victoriana/Steampunk, and especially creative storytelling, I highly recommend this book. There are three tales that stood out from the rest: Serpent in the Gears, Balfour and Meriwether in the Adventure of the Emperor’s Vengeanc I have a shelf of books that I've finally completed, but I was inclined to remember to do this book because I was just thinking about it today. I enjoyed the short stories, but moreso, the author's take on steampunk and its 'movement' and longevity. If you like anything Victoriana/Steampunk, and especially creative storytelling, I highly recommend this book. There are three tales that stood out from the rest: Serpent in the Gears, Balfour and Meriwether in the Adventure of the Emperor’s Vengeance, and The Anachronist’s Cookbook. A mixed bag, as anthologies often are. They picked the wrong (fiction) story to wrap it up, so my last impression was not favorable, but there were some good stories in here (mostly by the female authors, I noted, so thanks for making sure there was a distribution!). Wi A mixed bag, as anthologies often are. They picked the wrong (fiction) story to wrap it up, so my last impression was not favorable, but there were some good stories in here (mostly by the female authors, I noted, so thanks for making sure there was a distribution!). I did not read all of these, I've discovered that short stories just don't do it for me anymore. When I like them, I want the full story. When I don't like them, they feel like a waste of time. I mainly got this one to read the Daniel Abraham short about Balfour and Meriweather which was good, but way too short. I also read Cherie Priest's short and this one was much more of a mini middle-grade horror story than anything else and it was too creepy for me. I had planned on reading a couple more but I did not read all of these, I've discovered that short stories just don't do it for me anymore. When I like them, I want the full story. When I don't like them, they feel like a waste of time. Steampunk fans, this is definitely for you! Happily, I found every story in this 425 page book to be entertaining and unique from most of the others. My experience with anthologies is that even some of my favorite authors' stories lack the spark and interest of their books, so I steer clear. I finally read this one (a gift from years ago) and am very glad I did! This was a great anthology. I prefer short stories at time, so always keep a few on hand. When I can't decide what to read next, I dive into a story or two. I passed over very few of the stories & did not read the non-fiction content. The rest was great stuff that entertained. Each story was different. I like the variety in the stories. I would recommend this to anyone who likes the Steampunk genre & who likes short stories of the same. I've been working on my steampunk cred since I'm currently writing a steampunk erotica short story collection. Some of the stories in this antho were brilliant, others just weren't my thing. I loved the nonfiction essay at the end, and the random character sketches of properly steampunk goodness. Very interesting that this recent literary movement can be interpreted in so many different ways! Ann VanderMeer is an American publisher and editor, and the second female editor of the horror magazine Weird Tales. She is the founder of Buzzcity Press. Her work as Fiction Editor of Weird Tales won a Hugo Award. Work from her press and related periodicals has won the British Fantasy Award, the International Rhysling Award, and appeared in several year's best anthologies. Ann was also the founder Ann VanderMeer is an American publisher and editor, and the second female editor of the horror magazine Weird Tales. She is the founder of Buzzcity Press. Her work as Fiction Editor of Weird Tales won a Hugo Award. Work from her press and related periodicals has won the British Fantasy Award, the International Rhysling Award, and appeared in several year's best anthologies. Ann was also the founder of The Silver Web magazine, a periodical devoted to experimental and avant-garde fantasy literature.